Looking to help your pitchers with their zone control. Then grab Clyde & some paint. 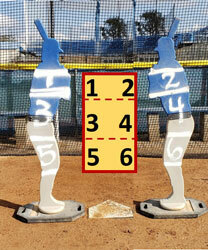 Helping your pitchers see where their pitching zones are is easier than you might think. Pitching zones are imaginary things that kind of float in the air, are critical to every pitch that’s thrown, and yet can be hard for our pitchers to actually see. To solve that problem, we took a can of white spray paint, our plastic batter our pitcher’s call Clyde, and went to work. We turned Clyde into a lefty and painted lines to make the 3 different zones, and then numbered them with 1, 3 & 5 to show our pitchers where those 3 zones actually fall on a lefthanded hitter. For a righty hitter we turned Clyde around and did the same thing on his other side, just with the rightside zones – 2, 4 & 6. This simple little addition to Clyde has made a big difference with our pitchers being able to not only see where each of these 6 different zones are located, but hit them with much better regularity. If you’re looking for a great collection of the best pitching experts in the country, check out our Pitching Summit Vault! Awesome idea!! I really like it. My pitchers like it.